“Please consult your local Rabbi regarding all halachot pertaining to the Sukkah”. 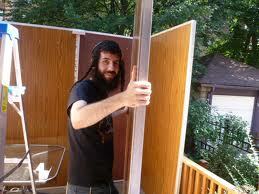 To build your own Sukkah, first select a site that has nothing hanging above it, i.e. a roof or a tree. The Sukkah floor space must be at least 27 inches by 27 inches (67 cm), the minimum space for most of a person to sit on a small table. If you don’t have a yard, then an apartment balcony will do just fine, provided it has no roof. A “kosher” Sukkah needs at least two complete walls and a small part of a third wall. The walls can be of any material, as long as they are sturdy enough to withstand a normal wind. The walls should be at least 38 inches high (96 cm), but not higher than 30 feet (9.6 m). You don’t have to build walls especially for the Sukkah; you can use the side of a building, or even a hedge of bushes. And if you can find an area that is already enclosed by 2 or 3 walls, then your job will be that much easier! The Talmudic term for roof material is S’chach, from the same root as the word Sukkah. The roof must be made from a material that grows from the ground — i.e. branches or leaves (but not metal, or any food). If you’re using unfinished boards, they cannot be wider than 15 inches. Also, the material must be presently detached from the ground — i.e. don’t just bend a tree over the top of your Sukkah! The roof material can only be added after the requisite number of walls are in place. The roof must be sufficiently covered so that it gives more shade than the sun during the daytime. Yet it should be sufficiently open so that the stars are visible through the roof at night. Since the Sukkah is designated as your “home” for the next seven days, it is customary to decorate it nicely. Many people hang fruits and flowers from the ceiling, and tape posters of Jerusalem and other Jewish themes on the walls. Sukkot hearkens back to times in ancient Israel when Jews would build huts near the edges of their fields during the harvest season. One of these dwellings was called a “sukkah” and “sukkot” is the plural form of this Hebrew word. These dwellings not only provided shade but allowed the workers to maximize the amount of time they spent in the fields, harvesting their food more quickly as a result. Sukkot is also related to the way the Jewish people lived while wandering in the desert for 40 years (Leviticus 23:42-43). As they moved from one place to another they built tents or booths, called sukkot, that gave them temporary shelter in the desert. Hence, the sukkot (booths) that Jews build during the holiday of Sukkot are reminders both of Israel’s agricultural history and of the Israelite exodus from Egypt. Waving the lulav and etrog. At the beginning of sukkot (often during the days between Yom Kippur and Sukkot) Jews construct a sukkah. In ancient times people would live in the sukkot and eat every meal in them. In modern times people most often build a sukkah in their backyards or help their synagogue construct one for the community. Since Sukkot celebrates the harvest in the land of Israel, another custom on Sukkot involves waving the lulav and etrog. Together the lulav and etrog represent the Four Species. The etrog is a kind of citron (related to a lemon), while the lulav is made of three myrtle twigs (hadassim), two willow twigs (aravot) and a palm frond (lulav). Because the palm frond is the largest of these plants, the myrtle and willow are wrapped around it. During Sukkot, the lulav and etrog are waved together while reciting special blessings. The lulav and etrog are also part of the synagogue service. On each morning of Sukkot, people will carry the lulav and etrog around the sanctuary while reciting prayers. On the seventh day of Sukkot, called Hoshana Rabba, the Torah is removed from the Ark and congregants march around the synagogue seven times while holding the lulav and etrog. The eighth and last day of Sukkot is known as Shmeni Atzeret. On this day a prayer for rain is recited, demonstrating how the Jewish holidays are in tune with the seasons of Israel, which begins on this day.